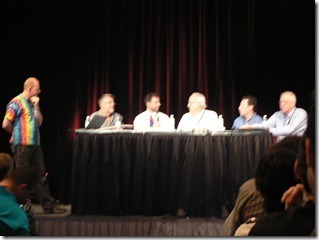 This PDC session was a little different from regular PDC sessions as this was not composed of a speaker and a presentation, but is composed of a panel of experts instead. This panels was composed by: Butler Lampson, Erik Meijer, Don Box, Jeffrey Snover, Herb Sutter and Burton Smith. What is your view on transactions? Can type systems help us write better code? Should pointers across machines (distributed pointers) be explicit? “Boundary transitions should be clear and known to the developer”. “The boundary transition should be clear since the connection to the pointer destination can fail, as opposed to the path from cache to RAM which rarely fails and thus transition boundaries there are not known to the user”. “URLs are actually remote pointers”. “I lung for the day that URLs are treated as first class language constructs”. Should we leverage the GPU cores for computational purposes? “GPUs are going to take form of more general purpose processors in the future, but we’ll probably going to call them GPU’s for a long while”. “We’re going to see much variety in processor architectures specialized for certain purposes and GPUs are going to be one of these types. The question is how do we utilize all of these CPUs in a uniform way”. “Developers don’t really want multi-core processors. They want faster single cores”. Should we have garbage collection in C++? “Having garbage collection is really really important… What was the question?” and in response: “His memory was garbage collected while he was speaking”.